Creative Think: Hooray for Mad Men! Mad Men is the creation of former Sopranos' writer-producer Matt Weiner. The show is about the advertising industry and is set in the New York City of 1960. The title refers to "Madison Avenue" and this was the dawn of advertising's "golden age." In this world, everyone smokes. Everyone drinks at work (sometimes before noon). And the women are either secretaries or housewives. 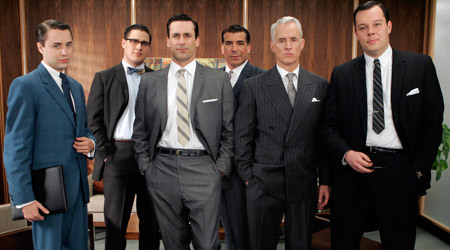 The show centers around star creative director Don Draper (3rd from left, played by Jon Hamm). It was fun to see the creative teams come up with ideas for various products such as: Lucky Strike, Kodak's slide projector, Richard Nixon's Presidential campaign, Israel Tourism Board, Bethlehem Steel, and a New York department store. It was also a kick to hear them talk about the new art of "Brainstorming" and how to do it! Mad Men just won a Golden Globe for best "Dramatic Television Series," and Jon Hamm won for "Best Dramatic Actor." (He is very good.) Congratulations! I also liked Mad Men a lot. Their producers and directors went to a lot of trouble to nail the "look of 1960" right down to the clothing, hairstyles, and home furnishings. Gwen: Yeah, I noticed that as well. What they also did fairly well was capture the attitudes of the period. For example, one of the seven year old kids comes out of the parents' bedroom wearing a plastic dry-cleaning bag over her head, and says she's playing "Astronaut." The mom gets pissed not because the kid might suffocate, but because she fears that the kid probably wrinkled the dry-cleaning. Perfect! I'd been meaning to check this out. In fact, it's on tonight at midnight EST. I set the TiVo. You mentioned Bethlehem Steel... I grew up across the street from Bethlehem Steel. When I was a kid, I can hear all the work going on. When it closed... the entire property got dark and quiet. I'm interested in how Bethlehem Steel was mentioned on the show. I'll have to keep a look out. Perhaps it is the forced obligation of constantly having to create that makes you feel negative. If you could work your business around creating when and what you like to create, you might live a more fulfilled and happy lifestyle. I spent the weekend watching all the episodes of Mad Men. I too enjoyed the "brainstorming" and "creating" aspect of the show. Today, I was reading an old Breakpoint commentary by Chuck Colson. He wrote, "Remember the detective show "Cagney and Lacey"? Every time one of the detectives climbed into the squad car, she buckled her seatbelt. It was part of an organized campaign to boost seatbelt use. The idea is that if people see TV characters buckling up, that's going to have a subliminal effect on them." Colson's commentary got me thinking. Is the motive of Mad Men's producers to entertain? Is it too sell BMW's? Or is to persuade its audience to drink copius amounts of hard liquor, smoke cigarettes and cheat on your wife?